On Tuesday, after our visit to the datacenter, Andrew Blum made a comment about stories that made me think back to our discussions of “mapping” networks. I can’t remember his exact words, but Blum was talking about the way that our guides presented the data center to us, saying that people who are immersed in that kind of work often don’t tell the story that we want to hear. His comment led me to another comment from the introduction to his book, Tubes, in the section where he discusses the “folk cartography” of Kevin Kelly. 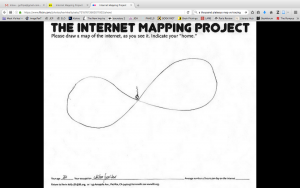 Blum explains how Kelly solicited the public to submit hand-drawn maps of their conceptions of the internet (“Internet Mapping Project”). A researcher, Mara Vanina Oses, from the University of Buenos Aires, analyzed these maps by their topologies (here’s her presentation) . Blum notes that while these maps are perceptive, displaying our awareness of our experience in the network, none of them actually reference the physical machines and tubes that make up the network. And he rightly points out that ignorance about how these infrastructures actually work is dangerous: “the great global scourges of modern life are always made worse by not knowing. Yet we treat the Internet as if it were a fantasy” (7). “The tracing has already translated the map into an image ; it has already transformed the rhizome into roots and radicles. It has organized, stabilized, neutralized the multiplicities according to the axes of significance and subjectification belonging to it. It has generated, structuralized the rhizome, and when it thinks it is reproducing something else it is in fact only reproducing itself. That is why the tracing is so dangerous. It injects redundancies and propagates them” (A Thousand Plateaus 13). There’s an analogy where we can associate Kelly’s “folk cartography” with D&G’s tracing, while the investigative work that Blum undertakes is like D&G’s mapping. All three theorists think that this tracing activity is potentially dangerous, because it neglects the workings of the actual infrastructure that exists outside the mind. But I think there’s something to be learned by looking at these citizen “tracings” of the network. While Blum rightly points out that these tracings are fantasies, they reveal the aesthetic experience of being on the network, and how certain users tend to sense, at least on an abstract level, scope of the system. 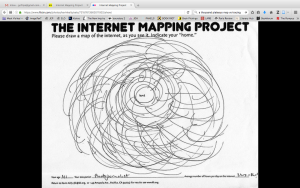 Although the maps from the “Internet Mapping Project” don’t explicitly indicate the cables and servers that make up the internet, they do reveal the sense of obscurity and incomprehensibility about the network. In their furious, numerous lines, or simple, abstract shapes, the users struggle to represent the connectivity of information. While people generally put themselves in the center of their own networks, meaning that they see the network as organized around their needs, they still suggest that the system is complicated, overwhelming, and in many ways beyond them. We can use these maps to reframe other topics we’ve discussed throughout the semester. What do they have to say about labor, conceptions of labor, or media and agency? 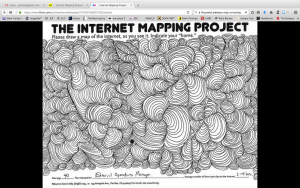 I do think these maps deserve a second look because they tell stories about how people experience the internet. It may not be the full story, but it’s worth listening. This entry was posted in Uncategorized on November 18, 2016 by Filipa Calado. I totally agree – in my opinion, it’s just as dangerous to discount or ignore the aesthetic experience of working with the internet. Unlike so many other activities, we engage with it mostly on a conceptual level, even while we’re making use of the material world to do so. Its interface with humans is practically invisible at this point, because of the way we have naturalized the extension of self and intention into the machines we use. It’s hard to remain conscious of that material interface until we get a 404 or spinning beachball or other malfunction that suddenly reveals that the seamlessness is an illusion. So the aesthetic and emotional experience is just as – often more – real then the material one, because it is not susceptible to interruption. Discounting this not only privileges theory over actual human experience– which ironically makes that experience less open to investigation–it also invalidates imaginative activity, which is a definitively human mode of engaging with the world.